Anita Volz Wien is Chairman of the Observatory Group, a macroeconomic advisory firm specializing in the analysis of global monetary, fiscal and legislative policy, founded in 2007. Previously, Ms. Wien was a partner and Vice Chairman of the G7 Group, which she joined in 1993, and earlier, a Senior Vice President of Oxford Analytica, following a 20-year career in brokerage, investment management and commercial banking. 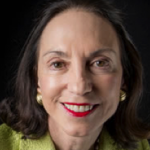 A member of the Council on Foreign Relations, the Economic Club of New York and the Women’s Forum, Ms. Wien served on the Board of Advisers of “Foreign Affairs.” She is a member of the Board of Trustees of Prep for Prep and the Ben Franklin House Foundation (London) and served on the Advisory Board of Carmel Asset Management. She is a Trustee Emerita of Smith College and a former board member of the Financial Women’s Association, the Women’s Campaign Fund and the Lighthouse, Inc. She holds a B.A. in History from Smith College and an M.B.A. in Finance from the New York University Stern School of Business. In 2013, Ms. Wien received the Stern Women in Business Distinguished Alumna award. She is fluent in French and German.